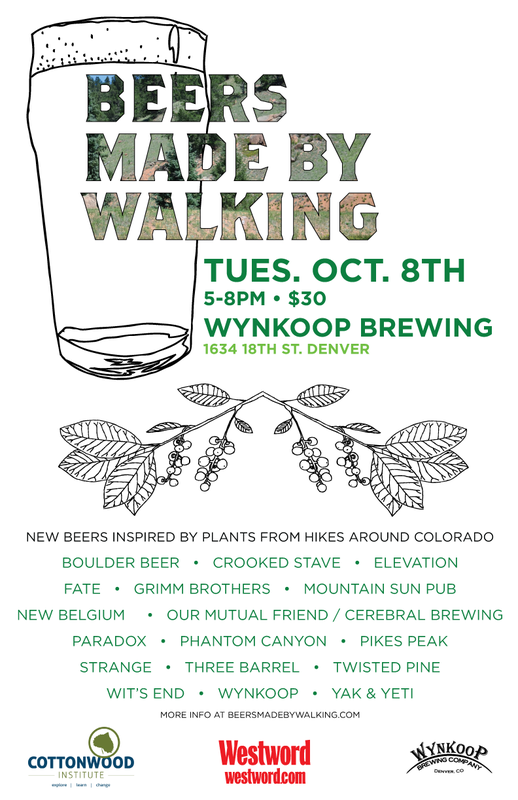 Announcing: Beers Made By Walking - October 8th in Denver! As beer lovers from around the country gather in Denver to celebrate the Great American Beer Festival and the Denver Beer Fest, we thought we would give these beery visitors a taste of the great state of Colorado. Beers Made By Walking has invited seventeen breweries across the state to take a hike, literally, and then make specialty beers inspired by the edible and medicinal plants found along the trail. These seventeen beers, made specifically for this event, will be available for one night, Tuesday, October 8th, at Wynkoop in Denver. Each beer in this series is innovative in that they are drinkable landscape portraits of areas throughout Colorado. You’ll get to taste a portrait of Boulder’s historic Chautauqua Park, the Palmer Lake Reservoir Trail in Colorado Springs, a beer inspired by a neighborhood stroll in Denver, and many others. We are very happy to announce that this year, a part of the proceeds from the event will be donated to the Cottonwood Institute in Denver. The Cottonwood Institute is an award-winning 501(c)3 non-profit organization that inspires young people to initiate positive change by strengthening their civic engagement, environmental stewardship, and leadership skills. Boulder Beer, Crooked Stave, Elevation, Fate, Grimm Brothers, Mountain Sun Pub, New Belgium, Our Mutual Friend with Cerebral Brewing, Paradox, Phantom Canyon, Pikes Peak, Strange, Three Barrel, Twisted Pine, Wit’s End, Wynkoop, and Yak & Yeti. The beers will be available for one night only in Denver on October 8th, from 5-8pm, at Wynkoop Brewing (1634 18th St.) in their upstairs bar. Tickets will be available at Wynkoop on the night of the event or you can purchase them in advance here. Tickets cost $30 and give you access to unlimited samples of each specialty beer. As part of its daily online coverage of Denver’s dining and drinking scene, Westword closely follows the Colorado craft beer industry. Find their stories at cafesocietyblog.com and on Facebook.